Here’s a 12%+ ABV old ale recipe that develops its rich color and flavor via a 5-hour boil. Brewer Joe Walton has made this many times and the beer has won medals at many competitions. If you’ve got nearly a whole day to dedicate to brewing, try this monster ale recipe. The recipe is presented in both English and metric units. As most extract brewers would not have the capacity to begin boiling 10.5 gallons (40 L) of wort, there is no extract adaptation for this recipe. 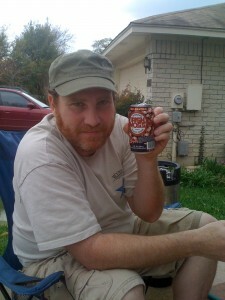 Brewer Joe Walton, with a can of Jamaican soda called Irish Moss. This is an all-grain old ale I have brewed over 20 times. It was inspired from reading an article that said you could get the characteristics of melanoidins from a long boil. The long boil caramelizes the sugars as well as breaks down many proteins. This also allows you to get these characteristics without using large amounts of specialty malts that may leave behind some harshness or astringencies that are not desired. It is a very smooth and rounded beer and the high alcohol content is not readily detectable to the drinker. You can change the profile dramatically by switching between the Irish and Scottish yeast. I prefer, and the judges do as well, the Irish version (it’s smoother). I have added a pound or two of peat smoked malt to make the “Scottish” version. It has won many awards in national and local competitions, including a first in the Austin ZEALOT’s Homebrew Inquisition. Make yeast starter 2–3 days ahead of time. On brewday, heat brewing liquor to ~164 °F (depending on system efficiency) and mash grains at 152 °F for 60 minutes. Stir the mash a couple times if you can do so and maintain temperature (via heating mash tun or adding hot water). Mash out around 168 °F. Recirculate wort until clear, then run off. Sparge steadily over 75–90 minutes to collect about 10.5 gallons of wort. Vigorously boil wort for 5 hours (yes, you read it right, 5 hours), to yield post-boil volume around 5.5 gallons (I lose about a gallon per hour, this can be controlled with using a lid to contain the vapors, but make sure brew kettle is completely uncovered for the last 30 minutes of the boil to make sure all the volatiles are gone. Make sure the boil is hard, a soft boil will not get the desired effects. Water can be added before the last hour of the boil to keep volume if necessary. Add hops, Irish moss and yeast nutrient at times indicated. Chill wort, then rack to fermenter. Aerate wort thoroughly and pitch sediment from yeast starter. Ferment at 64 °F. Let the fermentation go a little longer then you think it needed. 6 weeks minimum. Wood aging techniques are also a plus. The longer on the wood the better. I have done 6 months on oak and it came out wonderful. The beer ages extremely well. Does not hit prime until at least 6 months in the bottle or keg. I have 10 year old bottles that are still in incredible shape. I have found that the beer reaches peak condition at 3 years old. Make yeast starter 2–3 days ahead of time. On brewday, heat brewing liquor to 73 °C (depending on system efficiency) and mash grains at 67 °C for 60 minutes. Stir the mash a couple times if you can do so and maintain temperature (via heating mash tun or adding hot water). Mash out around 76 °C. Recirculate wort until clear, then run off. Sparge steadily over 75–90 minutes to collect about 40 L of wort. Vigorously boil wort for 5 hours (yes, you read it right, 5 hours), to yield post-boil volume around 20 L (I lose about 4 L per hour, this can be controlled with using a lid to contain the vapors, but make sure brew kettle is completely uncovered for the last 30 minutes of the boil to make sure all the volatiles are gone. Make sure the boil is hard, a soft boil will not get the desired effects. Water can be added before the last hour of the boil to keep volume if necessary. Add hops, Irish moss and yeast nutrient at times indicated. Chill wort, then rack to fermenter. Aerate wort thoroughly and pitch sediment from yeast starter. Ferment at 18 °C. Let the fermentation go a little longer then you think it needed. 6 weeks minimum. Wood aging techniques are also a plus. The longer on the wood the better. I have done 6 months on oak and it came out wonderful. The beer ages extremely well. Does not hit prime until at least 6 months in the bottle or keg. I have 10 year old bottles that are still in incredible shape. I have found that the beer reaches peak condition at 3 years old. Seems like a lot of crystal. Also, you mentioned using a pound or two of peat malt. I have never used it myself but Jamil says peat should be used in very small quantities; by the ounce. What’s your take? I guess for that version of beer I want the peat over the top (I got a comment once from a style nazi that there was not enough peat for the “style”,so I went with the I’ll show you philosophy and it worked!). I would do the lesser amount if you’re worried about it. However, the pound I found was the best ratio for this beer, my taste of course. I’ve been working out how to best hit the right gravity for this style with some recipes I’m trying. I have the same question as above about this recipe, are you really using 4 LB of crystal 40? Did you mean 4 oz? I have some twice used 12 gal barrels, I can’t wait to age some ale in em. Yes, Joe uses 4 lb. of crystal in his recipe (see the above comment). This is more than most comparable recipes would call for, but that’s how he likes it.